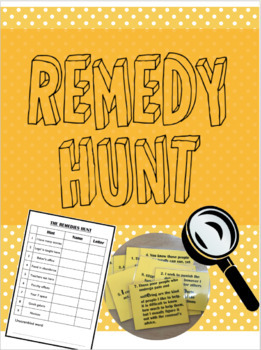 An activity to teach or revise the different types of remedies, damages and injunctions. There are 9 clues which are to be placed in a variety of areas around the school. 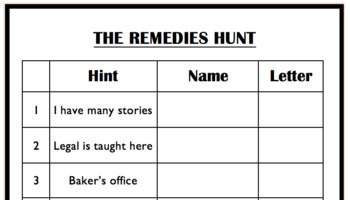 Each clue outlines a situation describing a particular type of remedy. Students are to depict the type and write the answer on their activity sheet. 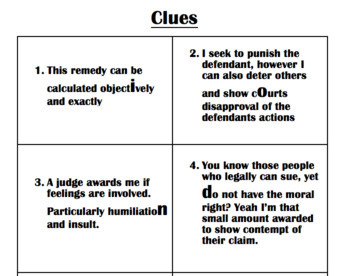 Additionally, on each clue there is a letter which is enlarged and bolded. Students are to record this letter on their activity sheet where they will arrange the letters into a civil word. I recommend printing the clues out on a bright coloured paper and laminated, as shown on my front page. This allows students to find the clues more easily and avoid getting damaged from weather, use etc.